In this post I will explain how to seed database users roles dotnet core 2.0 ef. For this we use the UserManager and RoleManager of the AspNetCore Identity framework. 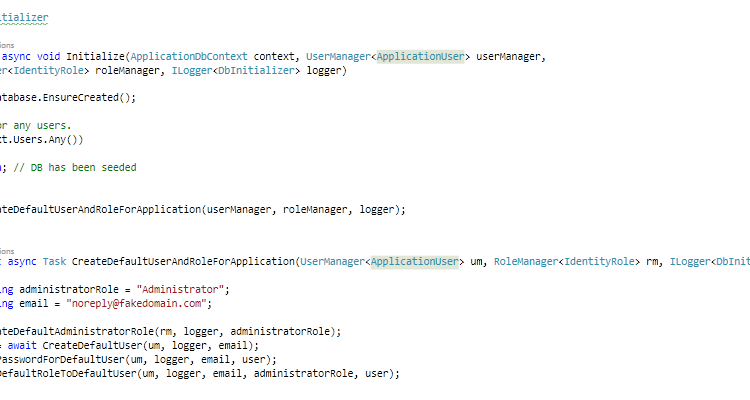 In that way, your application already has a default user and role for in example logging into the application. You can use it for test data but also for new installations of your application. In my case I will create a default Administrator user with the Administrator role attached to it for new installations of the application. Seeding a database in dotnet core 2.0 is different than earlier versions. I followed the basics of the new documentation of Microsoft to get to a good solution. So I first created a new project with the authentication set to Individual Accounts. This is almost the same code as the documentation but I also injected a RoleManager and UserManager so we can create the default user and role for the application. When the instances are created the Initialize method of the DbInitializer is called. This can be used to seed your database. Because I want to know more information about my users than just their email and username, I extended the ApplicationUser object that is used to create a user in the database with the UserManaer. I like constructors for new objects so I will use the long constructor to create my default user. The DbInitializer is the class that is used to seed the database. It is created by the program class. It has a static method Initialize that will be used to pass the external dependencies. The Initialize method will be used to orchestrate all the actions. // Look for any users. First a new Administrator role is created. In my application this is the highest role a user can have. When the role is created, a new default user is created with the earlier provided constructor. After the user is created, the user needs a password to sign into the application. So a password is set. The last step is to connect the user to the Administrator role so he has all the permissions that he needs. For logging, I use the default logging extension framework provided by dotnet core. I connected Serilog to the logging extension for better control.